One should dwell like the snake, which sees the mouse hide in ant-hill with six openings! 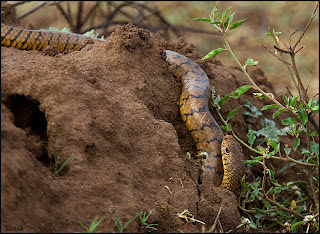 By lying rolled up on the anthill - constantly watching - the snake remains on the thought: Out of which hole may this mouse appear ?! Even so one thinks: Through which sense door may the next contact appear ? !